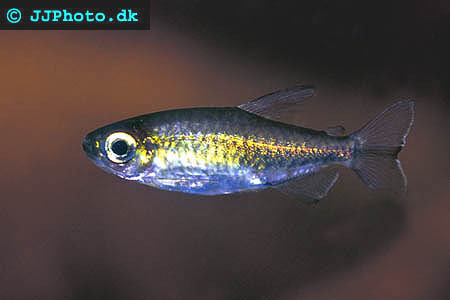 Company: Phenacogrammus interruptus (Congo Tetra) are suitable for community aquariums. Aquarium setup: Congo Tetras prefer a well planted aquarium with lot of dense vegetation and free areas to swim on. They require larger aquariums then many other tetra species. Should only be kept in groups of 8 fishes or more. Feeding: Phenacogrammus interruptus (Congo Tetra) accepts flake food however supplement might be needed to get them into breeding condition. 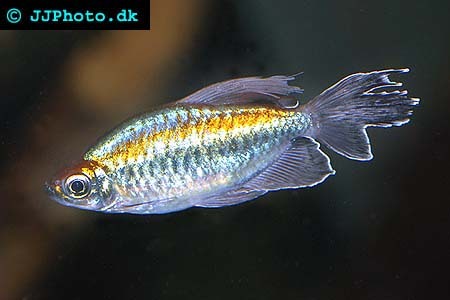 Breeding: Congo Tetra males are easily distinguished by their extended finnage and bright colours in comparison to the shorter finned dull females. They are egg scatterers and a separate breeding aquarium is necessary for successful breeding. The fry grows very slowly.